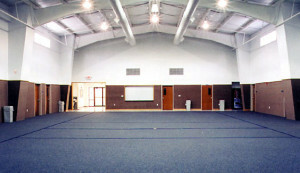 Each recreation facility has unique requirements. With thousands of steel buildings delivered all across North America, RHINO has the experience to provide you with quality-made prefabricated metal recreational buildings for any size facility. RHINO steel recreational buildings are designed to provide vast expanses of obstruction-free, clearspan area. Our structures with ceilings up to 40’ or even higher to accommodate specialized sports and recreational activities which require both horizontal and vertical space. Mezzanines can be added for viewing. Economical climate control is easy to achieve with the optional Pro-Value Insulation Package, and can save up to 50% on the energy operating costs of prefab recreational buildings. 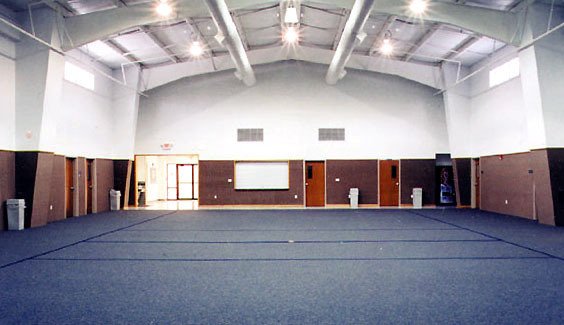 Why Choose Rhino for your recreational building? Reliability: You can depend on RHINO for both exceptional service and an outstanding product. RHINO is determined to offer the best customer service in the industry and our premium steel building system is second to none. Our standard building kit includes many benefits available only as options— if available at all— with lesser buildings. For example, our exterior roof panels are 26-gauge purlin bearing rib (PBR) style which provide a stronger, more waterproof and air-tight roof system. Also standard are matching steel cover trim for all door and window openings, extended-life zinc aluminum self-drilling screws, plus formed base trim, die-formed ridge caps, and closure strips for exceptional waterproofing. Durability: Affordable RHINO Steel Building Systems are factory-made to exacting standards to retain their strength and value for decades. Our prefab steel framing is guaranteed to meet or exceed all local steel building codes and loads for the lifetime of the structure. RHINO prefab recreational buildings provide extraordinary protection from fire, high winds, mold, termites, vermin, heavy snows, lightning, earthquakes, and even aging. Recreational buildings can be both functional and attractive with colorful, durable, maintenance-free steel panels exteriors. Facades of brick, stone, stucco, or tilt-up concrete can be used on a RHINO steel building for alternative styling. Discover The RHINO Difference for yourself. Call an experienced and friendly RHINO steel building specialist today to discuss your recreational steel building needs at 940.383.9566. Share the post "Recreational Buildings"